Meeting marine conservation challenges that are shared across many nations in Asia can be done more efficiently, effectively, and quickly if we work together across national boundaries. Environmental Defense Fund (EDF) is dedicated to building opportunities for collaboration between stakeholders, in part by convening a public forum during the Our Ocean Conference, in partnership with the China Association for NGO Cooperation (CANGO). We aim to launch an international network of practitioners in marine conservation to collaboratively build new solutions to priority challenges. Following the events in Bali, the network will organize research projects, training workshops, study tours, and other activities needed to achieve the goals set during the forum. China plays an outsized – and growing – role in world affairs, extending beyond the Asia Pacific region. This is certainly the case when it comes to the ocean, in which China is the dominant actor in the global seafood supply chain, among the top five maritime shipping nations, and poised to see growth in ocean energy development, mining, and tourism. With such significant economic activity tied to the oceans, China exerts considerable influence on the health of the marine environment. It also has a huge incentive to manage fishing sustainably, given that China accounts for 19 percent of the global fish catch. That’s one in every five fish coming out of the ocean. With that influence comes a responsibility to enhance environmental stewardship, one that is taking on an increasing focus in the evolution of China’s national policy. China has demonstrated a commitment to leading the way in shaping sustainable policies that will result in better environmental and social outcomes. The China Council for International Collaboration on the Environment and Development (CCICED) brings thought leaders from around the world together with their counterparts in China to deliver policy advice on a range of issues, including ocean conservation, to the highest reaches of the government. The 13th Five-Year Plan prompted the Ministry of Agriculture to launch a sweeping new fishery policy that calls for improvements in science, protection of habitat and biodiversity, monitoring, fishermen’s rights, and other essential aspects of sustainable management. One core element of policy is the initiation of fishery management pilot projects in five provinces that will test new solutions. Moreover, China has made an equally strong commitment to exporting effective solutions across the globe: CANGO, our partner in convening the forum, works to build international collaboration and scale effective solutions as a central part of its mission. After years of working with fishing communities and stakeholders around the world, it’s clear that active collaboration and learning across time zones can yield powerful returns for our ocean. And it’s not just governments, scientists, and NGOs that benefit from learning and collaborating with colleagues in other countries. 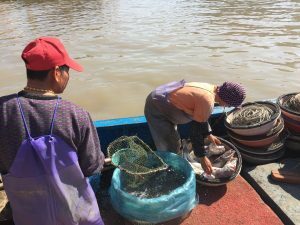 Fishermen can identify approaches that have worked elsewhere to solve problems similar to the ones they are facing. Fishery exchanges are taking place more and more around the world, allowing countries to learn from one another on how to sustainably manage fish populations. We are giving longevity to these interactions through more formalized learning networks. Last year, a fisherman from Cape Cod, Massachusetts and I were invited to a workshop in Hangzhou, the capital of China’s Zhejiang province. There, we shared our experiences with U.S. monitoring and management with a group of Chinese government officials, academics, and non-governmental organizations. During our trip, we visited the Marine Fisheries Institute of Zhejiang, local fishing ports, and seafood markets in the Zhoushan Archipelago, which in many ways is the center of China’s fishing industry. Much of what we saw looked very different from fishing ports in New England, yet many of the fundamental characteristics, challenges, and solutions being explored were not so different. Our Chinese hosts saw possibilities for their own fisheries in approaches and solutions we shared from New England. Exchanges like this make it clear that international collaboration is key to the success of sustainable global fisheries. This entry was posted in Global Fisheries, International and tagged Asia, Asia pacific, China, collaboration, fisheries exchange, fishery exchange, global fishereies, Pacific. Bookmark the permalink. Both comments and trackbacks are currently closed.